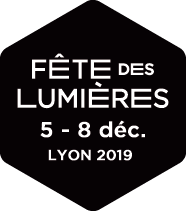 The result of a collaboration between the cities of Lyon and Zigong in China, the illumination of Rue de la République leads you deep inside the Chinese imagination, somewhere between past and present, dream and reality. This contemporary Silk Road swarms with colored lanterns in traditional or modern shapes. With the support of "Rue de la République, Bank of China and the government of Zigong.